The writer of the letter to the Hebrews said, "See to it that no one misses the grace of God." Over the centuries much ink has been spilled on the subject of grace. Yet perhaps nothing is as hard to explain as God's grace. It doesn't make sense. It's not fair. It can't possibly cover over what I've done. The best way--perhaps the only real way--to understand it is to experience it. But too often in our churches we're not getting grace across and grace is not experienced. 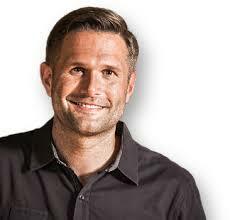 Bestselling author and pastor Kyle Idleman wants everyone to experience the grace of God. Through the powerful medium of story, Grace Is Greater leads readers past their hang-ups toward an understanding of grace that is bigger than our mistakes, our failures, our desire for revenge, and our seemingly impossible situations. No sin is so great, no bitterness so deep that God's grace cannot transform the heart and rewrite the story. 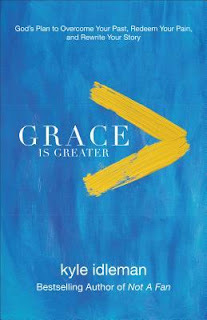 Perfect for individuals and also for small groups and church-wide studies, Grace Is Greater will help readers truly grasp God's grace, even if the Christians around them have failed to live it. Kyle Idleman is most likely my favorite non-fiction author. When I saw a post about being in the launch team for his new book, I immediately filled out the application and waited with fingers crossed......and was happy to get in on it. I have read, enjoyed, been convicted, and encouraged by all of Kyle's books. Grace Is Greater may be his best yet. Grace is a big subject to tackle, but Kyle does a great job of doing so in this book. He first emphasizes the grace that is available to us, no matter how bad we are or have been. He then goes on to address how we need to show the same grace we have received to others....even those who have wronged us. I found that part of the book very convicting, especially as I read examples of people who had forgiven much and showed grace to those who had severely wronged them. Often books of this type are stuffy volumes that are difficult to wade through. Grace Is Greater is far from stuffy or boring. Kyle writes of grace in a way that is interesting and entertaining as he tells his own faults in a self deprecating manner. Obviously it is going to take more than reading a book like this to change, but it is a great start. There is a lot of good and Biblical advice in here how to accept God's grace, how to show it, and how to forgive the unforgiveable. There are no quick and easy formulas, yet Bible-based instructions on how to get where we need to be. I highly recommend this book. It has the potential to be a life-changing book. Kyle Idleman is teaching pastor at Southeast Christian Church in Louisville, Kentucky, the fifth largest church in America, where he speaks to more than twenty thousand people each weekend. He is the bestselling and award-winning author of Not a Fan as well as Gods at War and The End of Me. He is a frequent speaker for national conventions and in influential churches across the country. Kyle and his wife, DesiRae, have four children and live on a farm. Grace Is Greater is available from Baker Publishing. 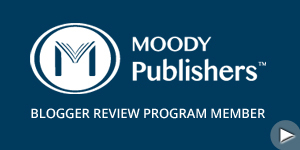 Thanks to Baker for the review copy.